Part of Ben Hull's award-winning Musket & Pike Battles series. The fourth installment in this series is a tactical battle game featuring five battles from the career of one of the Great Captains of History, King Gustav II Adolf the Great of Sweden. In his brief career, he catapulted Sweden to the forefront of European power politics. 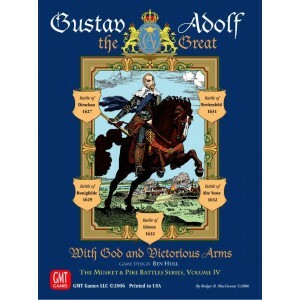 This volume sets it focus on the rise and climax of Gustav Adolf's military system. The series began with the English Civil War in This Accursed Civil War, then covered the Swedish army after Gustav Adolf in Sweden Fights On, then looked at the rise of the French in the Thirty Years War in Under the Lily Banners. In this volume the Swedish face the tough Polish cavalry, lance equipped winged Husars and Cossacks. The Swedish-style brigades also take on the unbeaten Tilly at the head of the allied Catholic League and Imperial armies. Finally, Wallenstein, with a resurgent Imperial army, mastered the art of drawing out the Swedes to attack on ground of his choosing. Dirschau 1627 - The Prussian campaign that started in 1626, Gustav Adolf had finally brought the Poles to the field and defeated them in battle at Gniew a month before, skillfully using terrain to offset the powerful Polish Hussars. Again the King faced the Polish General Koniecpolski and sought to the same again. Alte Veste 1632 - The late summer saw the Swedish besieged by Wallenstein at Nürnberg. Lützen 1632 - Southeast of Leipzig the Swedes caught up to the Imperial main body. Wallenstein's army had detached two corps and was serious danger. He fortified a position at Lützen. King Gustav Adolf's final battle. Honigfelde / Trzciano 1629 - "I've never had a hotter bath!" exclaimed Gustav II Adolf upon his return. Very nearly captured while trying to extricate his army from a Polish and Imperial trap, this great cavalry battle showed the Poles were to be treated with respect. Rheingraf Otto Ludwig's German cavalry attacked the advancing Poles and was drawn into a pincer. Gustav Adolf rushed forward to save the impetuous Rheingraf. Koniecpolski showed his cunning. The Imperial contingent joined the fray and sent the Swedes falling back. The Imperial commander, von Arnim, would take the field with Gustav Adolf at Breitenfeld two years later. Nominee for the 2006 Charles S. Roberts awards for Best Pre-World War II Boardgame (Charles S. Roberts Awards).